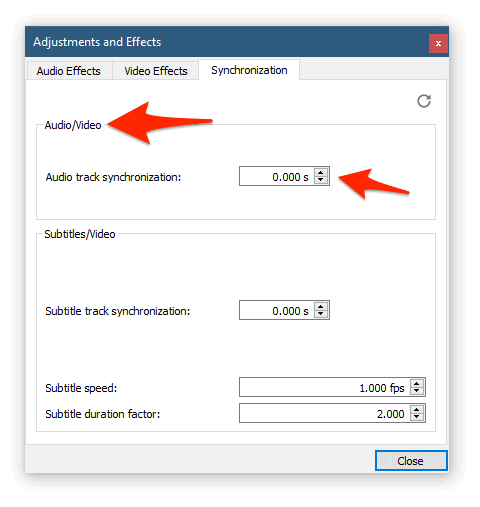 This brief guide will show you how to adjust the audio/video so that they’re in sync when you’re watching a video file. The quick solution is to use the amazing (and free) media player – VLC, and its easy to use built in audio delay/forward feature. If you aren’t using VLC yet, head over to their download page and give it an install. Note: this will work for all video formats, not just mkv/mp4/avi – they’re just common formats (and the 3 that I’ve found most often have sync issues). Locate the section titled Audio/Video – within that window there’s a ‘timer’ with “up and down arrows” to adjust the timing of the audio. This is where the magic happens. Use the “up arrow” if the audio is ahead of the video. That means if the people in the video are talking and you can hear them before their lips move, you’ll want to use the up arrow. That will ‘delay’ the audio, allowing the video to ‘catch up’. So in reverse, if the audio is behind the video you’ll want to use the “down arrow”. That will speed the audio up. In both instances, when you use the up and down arrows it will adjust your audio by 1/10th of a second per click. Let the video play while you’re making the adjustments – but note that it’ll take a second or three for the change to take place each time you adjust the sync timing. In Windows, VLC has the ‘J’ and ‘K’ hotkeys predefined for quickly adjusting audio offset by increments of 50ms. Thanks for the info! However, I can’t figure out what the next step is, in order to save the video clip. I’m on a Mac. Any clues?